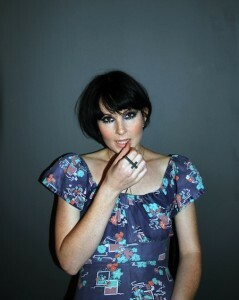 Singer-songwriter Becky Jones moved to London from Stockton-on-Tees 8 years ago to pursue a career in music. Having previously collaborated with Groove Armada (notably, on the stunning "I Won't Kneel") and worked with her own London-based 'powerpop' troupe, The RGBS, she now writes and records as a solo artist, under the moniker Saint Saviour. Last night she gave an electrifying headline performance at Hoxton Bar & Grill, dazzling the crowd with her incredibly powerful soprano and sung soliloquies, set to an ethereal musical backdrop and beats that draw you in instantly. On stage she contorts and whirls around, never not in the moment, a vivid example of that je ne sais quoi-ism 'stage presence'. It's easy to see why, vocally, Jones often gets compared to Kate Bush and Elizabeth Fraser and, whilst her sound at times brings to mind contemporaries such as The Knife and IAMAMIWHOAMI, there is something very original about it too. Live highlights last night included "Fallen Trees", "Birdsong" and "Here In Me", the lead track from her new EP, "Suukei", which is out next month. Where does the name Saint Saviour comes from? I live in Bermondsey. I go running a lot and I normally run past St Saviour's Dock. There are lots of old workhouses, warehouses and beautiful old buildings with 'Saint Saviour' written on them. 'Saint Saviour' seems to crop up a lot in that area and I think it's got a nice feel to it so... I nicked it! What's happened to your band, The RGBs? We decided that the band's music was definitely about a trend and it kind of just went out of fashion. Are there any songs that you wrote for the band which you'll be keeping for your solo career? I did actually write "Birdsong" [which appeared on her previous Saint Saviour EP, "Anatomy"] when I was with The RGBs and we started rehearsing it but then we did nothing with it so I kept it as a Saint Saviour song. But, really, that was it - the band's music was very 'niche' and I don't think I will use any other bits of it. Yeah, I was doing a collaboration with some illustrators for a hymn-style lyric book that I was selling for the Tsunami-appeal for Japan and one of the illustrators used SUUKEI, the Kanji symbol for the word 'reverence', and I thought that was a good word for it because the songs on the EP are all about revering something or someone. You've covered some time-honoured classics like Joy Division's Love Will Tear Us Apart, Depeche Mode's Enjoy the Silence and Kate Bush's Army Dreamers. Why cover those songs? If I cover a song it's normally because I find it heartfelt and have some sort of a connection with it... I love Depeche Mode in general and I feel that I did quite an original version of that song. I actually did the Kate Bush one because I am constantly being compared to her and I had never actually listened to her stuff before. So one day I just decided to listen to her music - I listened to quite a lot - and chose to do an acappella version of "Army Dreamers". There's one song that I really want to do a cover of and that is "Always" by Erasure. I just think it is so so beautiful. The other one I would love to do is "I'm In Love With A German Filmstar" by the Passions, which is such a wicked tune but so many people have covered it already, including Sam Taylor-Wood, so I don't think I'm going to bother with that one. Whenever you are written about, your voice always gets a special nod. Do you have a daily vocal warm-up routine to look after your voice? When I did my music degree I specialised in the voice and I understand the biological workings of the muscles involved and, therefore, I know what to avoid in order not to ruin my voice. I do about an hour of exercises and warm-ups in the morning. So every day I get up and go to the gym and then I start singing by 9am. So far you've released your music on EPs. Can we expect a full-length album soon? I'm actually working on the album at the moment. I have a day-by-day schedule of trying to finish various songs and my band are working on it as well. I will finish it by mid-December. However, I have no idea when it will actually get released. I reckon early spring-time next year. Will the album include material that has previously appeared on your EPs or will it be all-new material? I have constant direct contact with my fans and I am very wary of putting lots of stuff out there for them to listen and then re-using it for the album. And I have so much material - 18 songs that I am having mixed and we will hone the album down to about fifteen and they're all going to be new songs. I might put "This Ain't No Hymn" on it just because I think it deserves the opportunity to go back out there. Speaking of "This Ain't No Hymn", it was used in the official trailer for Gerardo Naranjo's new thriller, Miss Bala. How do you feel about that and about licensing your music in general? I was really happy to be associated with the film. The thing about synch-licensing deals is that they seem to be the only remaining way that I, as a musician, can make money. So they're really important. Touring is an investment-only thing. It costs so much money. You have to be quite clever with what you do in order to actually make money from touring. I can make some money from selling CDs but only if I do everything myself, rather than selling them via a third party. If you were offered the chance to write a song for an X-Factor contestant, for example, would you jump on the opportunity or regard it as selling out? I would totally do it. I have great respect for people who write so-called 'standard' pop tunes. It is actually a craft. When you are a pop writer you have to be very disciplined about how you write. I would consider myself a bit unworthy of it at the moment, to be honest, because my song-writing is quite free and not very structured. I would say that being a pop writer is more of a skilled thing than what I am doing at this moment in time. Suppose Nadine Coyle doesn't rejoin Girls Aloud for their planned reunion and, hypothetically speaking, you're asked to be the fifth member in a Sugababes-style member replacement manner... Would you do it? High heels. I just absolutely could never do it because I can't wear high heels or tight clothes on stage. I have to feel completely free. I have to be able to throw tantrums on stage and tell people what to do. And I just don't think that there is a place for democracy when you are in a band. I would totally piss everybody else off. Saint Saviour's new EP, SUUKEI, comes out on 3 October.